Holiday spirit and cheer were abundant last Sunday, December 7. The dining room was filled with families decorating gingerbread houses and on the other side of campus, Upper School Service Club members welcomed over 51 very special guests in the field house. 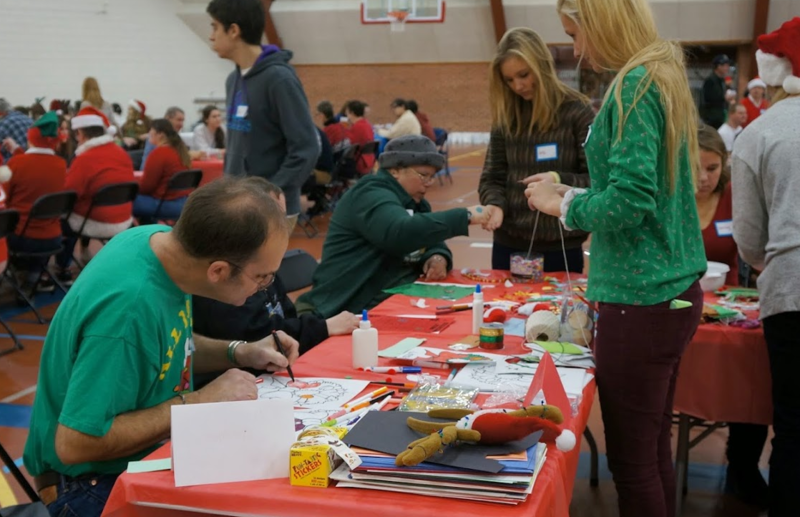 For over 30 years, Prairie has hosted and welcomed adults with cognitive disabilities to an annual Holiday party. The event, which initially started as a dance, receives reservations as early as September. 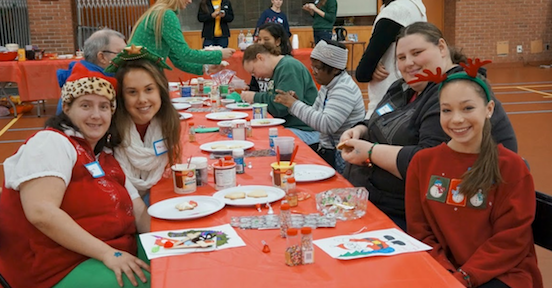 Through student and volunteer support, many guests are picked up at their homes so that they may attend and enjoy a festive afternoon of holiday crafts, bingo, ping pong, cookie decorating and more. Service Club leader and Upper School science teacher Shannon Schafer gives us a glimpse into the experience. What is your favorite part of this event? My favorite part is how excited the guests are to come and participate in every part of the day. For many of them, it truly makes their holiday and is something they look forward to all year. They are very expressive about how much they enjoy this day. This year, I even had a mom of one of our guests who’s been coming for many, many years tell me that the Prairie School Holiday Party is one of the two things in her daughter’s life (besides Special Olympics Camp) that she really looks forward to doing. I think that reaffirms what we’re doing is important. Our guests leave saying they can’t wait until next year! What do you think students gain from this opportunity? Students get to feel how special this event is for others; they get to experience bringing true happiness to another person. Our students are altruistic and giving of themselves in order to make someone else’s day special. They may be out of their comfort zone, but they get to see some of the difficulties that others deal with on a daily basis and learn from them. This year, one of our guests brought the story of his life and had some of our students (anyone who wanted to) read it. Many of those who did left it in tears. In it, he wrote, “if I can do it being disabled, I know you can do it if you try.” What a great message for our students. We would also like to thank the local organizations and individuals who contributed and helped make this event a success. Through this single event, the holiday spirit has reached so many. Happy Holidays to all! This entry was posted in All News, Community Outreach, Learn More About Prairie, Middle School, Premiere, Upper School, Volunteer & Event by Communications Department. Bookmark the permalink.